Four new signs of continued economic growth were reported this past week. Here's a two-minute rundown of news affecting wealth management. 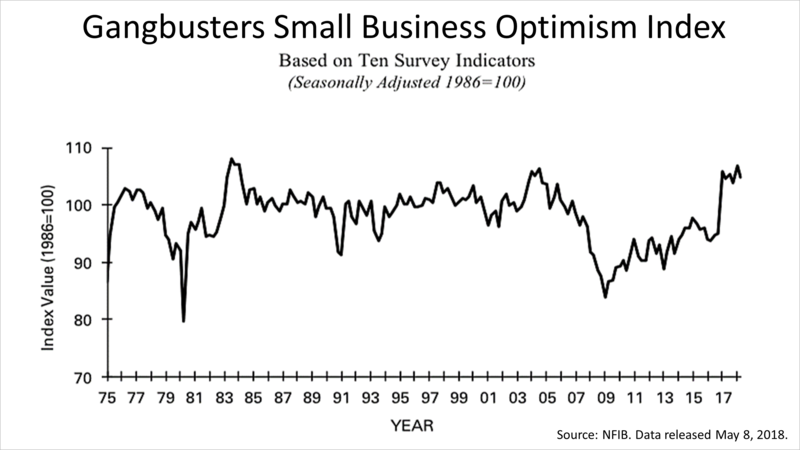 Business owner optimism has remained near its all-time high since the election. Small business owners created 60% to 80% of all the new jobs since the expansion began 107 months ago, so that's a good sign. 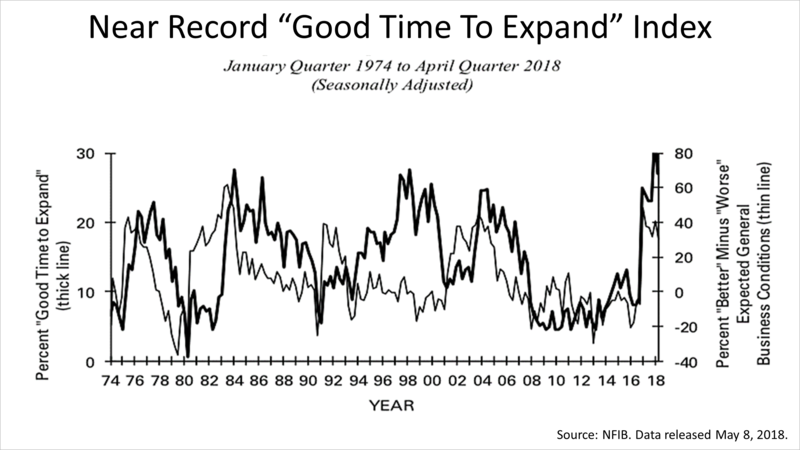 In addition, nearly 30% of business owners in April said it was a good time to expand, also pretty close to a record high. Meanwhile, in another good sign, job openings surged in March, according to the Department of Labor's latest monthly release. In March, employers advertised 6.55 million job openings and the job-openings rate was 4.2% - a record based on a data series dating back to December 2000. 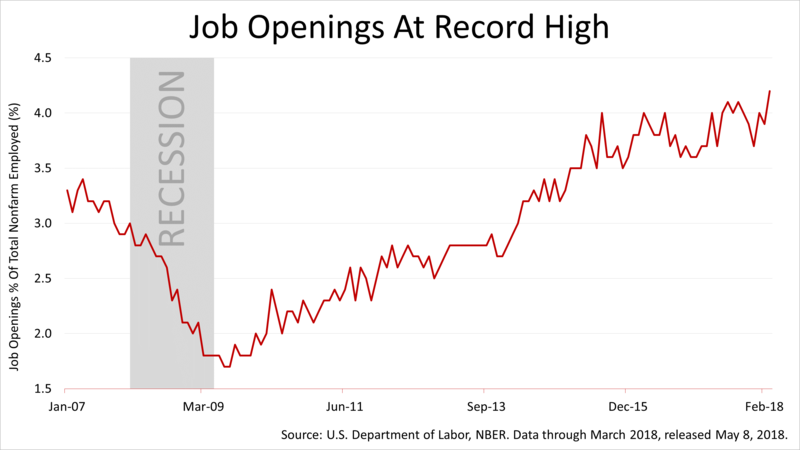 And, in an historical anomaly, the rate of unemployment was about the same as the job-openings rate: the ratio of unemployed to job openings was one-to-one in March, compared to seven-to-one emerging from The Great Recession in July 2009. 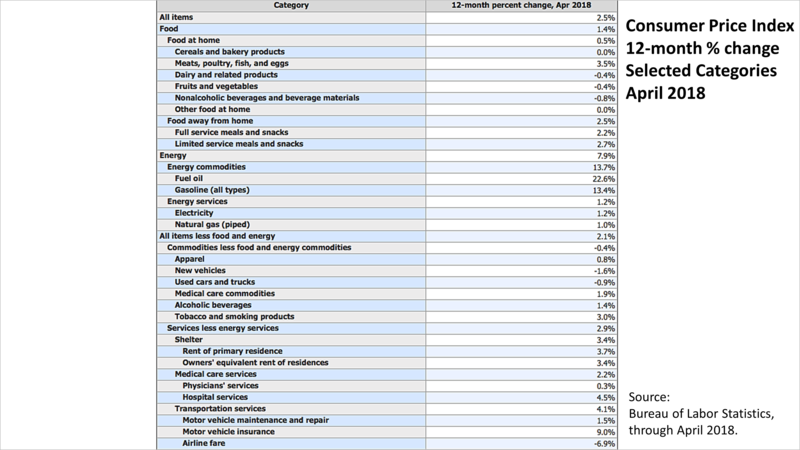 Despite all of the good signs, the monthly inflation rate release from the Bureau of Labor Statistics on Friday morning was benign. At 2.4%, the inflation rate is in line with the Federal Reserve's expectations, and the Fed has said it is so confident inflation will not heat up that it plans to allow it to exceed its 2% target rate without tightening credit and raising interest rates. 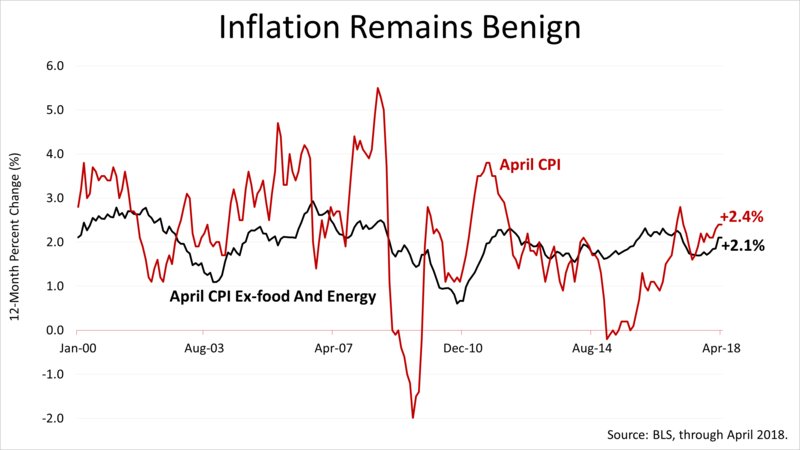 Food-price inflation is much lower than overall inflation compared to 12 months earlier. The cost of a car declined and airfare dropped sharply. Shelter, the biggest cost a household faces monthly, ran up 3.4% in cost, and so did the cost of energy. 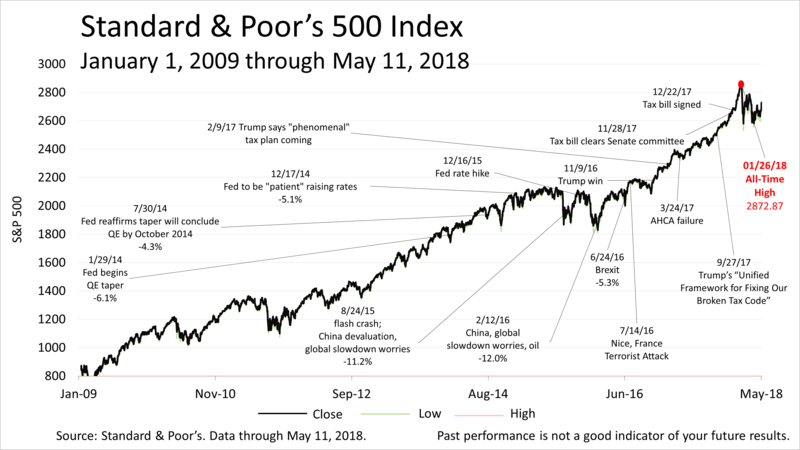 After three weeks in the doldrums, the Standard & Poor's 500 stock index since May 3rd has risen steadily and closed on Friday at 2727.72, not far from its all-time record high. 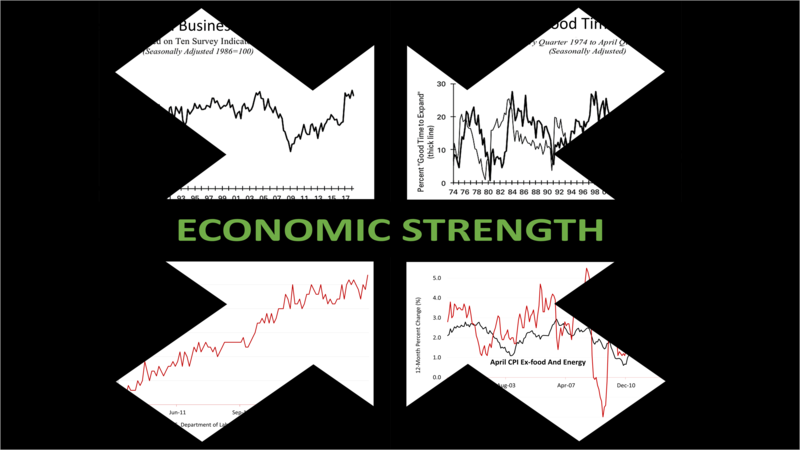 With expected earnings strong by historical standards, the stock market is fairly valued and not wildly overpriced - despite all of the good new signs of growth in the economy.